How Addictive Is the Caffeine in Soda? How addictive is the caffeine in soda? Caffeinated foods and beverages can lead not only to addiction but also considerable withdrawal symptoms. 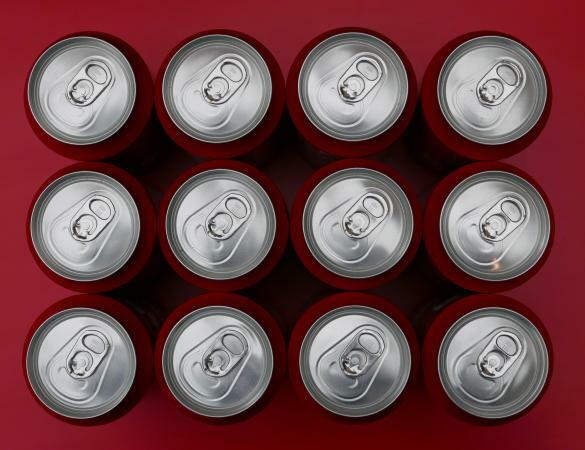 People who drink sodas containing caffeine regularly may develop a dependence on them. Caffeine addiction is typically associated with coffee, but caffeinated sodas can be every bit as addictive, according to some experts. Dependency on the stimulant can go unrecognized so it is important to recognize signs of a problem. US News and World Report lists 6 Signs of Caffeine Addiction. The signs relate to the withdrawal symptoms a person feels after abstaining from caffeinated beverages. While the article focuses on withdrawal symptoms from coffee, soda withdrawal can be problematic, too. When considering the question "How addictive is the caffeine in soda?" first let's look at the effects the stimulant has on the brain and nervous system. Caffeine is a stimulant that has a strong impact on the central nervous system and the brain. The stimulant belongs to the same chemical group as adenosine. Adenosine is a naturally occurring substance in the brain that causes drowsiness. Caffeine interferes with the neurotransmitters that bind to adenosine. This prevents the body from relaxing and the nerve cells accelerate. When a person suddenly abstains from caffeinated substances, withdrawal symptoms can occur. For some, the withdrawal symptoms indicate an addiction. Others argue that the stimulant is not addicting. As with many controversial nutritional debates there appears to be no conclusive evidence that it is, however many people do recognize a dependence on caffeinated substances for daily functioning. In addition to potentially becoming dependent on caffeine, people who drink sodas every day may experience dependency on other ingredients in the carbonated beverages as well. Most non-diet sodas contain a considerable amount of sugar, and although sugary substances are not currently classified as addictive, it does have a significant effect on the brain. Sugary foods cause the release of chemicals in the brain that are naturally pleasurable. In some cases, people may indulge in sweets in order to reach the bliss point, increasing the urge to repeat the pleasurable experience. When you merge the bliss-producing effects of sugar with the stimulating effects of caffeine, there is a potential for increased dependency on daily consumption of caffeinated soda. The beverages have a significant impact on the brain and regular use can lead to uncomfortable withdrawal symptoms when discontinued. The physical withdrawals are not enough to establish that soda is addictive, but they are indicators that the body may become dependent on the substance. It is important to note that the physical dependency on caffeinated soda is not the same as the dependency a person experiences using highly addictive drugs like heroin. Sugar and caffeine are not classified as addictive substances, medically or scientifically. However, they can be psychologically addicting. Another consideration to make is the potential for psychological dependence. Addictions can include physical dependence and can involve compulsive behaviors. The urge to consume caffeinated soda may exist on a psychological level. Some individuals are prone to follow patterns of behavior because they have an addictive personality. The addicting nature applies to sugary beverages as well as diet soft drinks. Diet soft drinks have the potential for dependency as well, whether physical or psychological. Many people choose diet soda for weight loss but these beverages have the potential to be counterproductive. Many people are faced with considerable challenges when they try to change their habits, especially when it comes to potentially addicting substances. People who crave sodas should begin by consulting their doctors. It is important to treat the habit with the recognition of the behavioral, psychological and physical components that come into play. A physician can help create a viable plan to help you overcome your dependency on caffeinated sodas. How addictive is the caffeine in soda? There is currently no definitive answer. However, if you find that the urge for caffeinated soda is a problem, the best way to address the problem is to talk to your doctor.